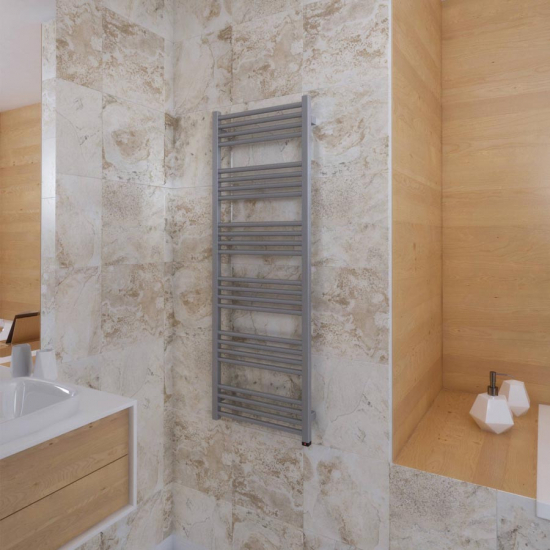 Terma Fiona ONE designer electric towel rails are a definitive must-have bathroom convenience, providing warm towels and independent heating for a range of spaces. Featuring a simple push-button interface, the Fiona can be controlled with ease, without the need for additional controllers. Styled with rounded bars and a sleek vertical frame, these designer towel rails add luxury appeal to kitchens, washrooms, and en-suites. Download or view the Fiona 480 x 1140mm assembly instructions & technical drawing here. Terma Fiona electric towel rails are rated IPX5 and must be professionally installed by a qualified electrician in a suitable bathroom location. Always defer to the manufacturer’s guidelines about the bathroom suitability of any product. For further installation information, please see the Terma Fiona mounting guide and product dimensions. Simple, elegant and refined, the Fiona by Terma exudes an aura of luxury wherever it’s installed. Available in a range of sizes to suit any space, it’s a must-have heating solution for sophisticated master bathrooms and intimate en-suites.